Jack is an ex-McKinsey, ex-Carlyle Principal/Partner with > 30 years of international finance accross telecoms, FIG and industrials. Originally pioneered by faith-based, nonprofit organizations, continuing care retirement communities (CCRCs) are residential alternatives for aging seniors that offer independent living units (apartments or cottages), residential amenities, and access to a continuum of healthcare services. CCRC service offerings typically include independent housing, meals, activities, transportation, and housekeeping; physicians, prescription drugs, and rehabilitation services; and skilled nursing and memory care services. "Type A" contract elements are a threat. CCRCs principally contract with their residents in three ways. Under one form of contract, a Type A contract, many CCRCs offer soft promises to continue to provide care until death, even after a given resident has exhausted his/her personal resources. Include embedded insurance contracts. Though these Type A structures fulfill the philanthropic missions of their faith-based founding organizations, they also create complex long-term care insurance obligations that most operators do not properly underwrite and that most states do not regulate. Result is widespread actuarial insolvency. Many facilities that issue Type A contracts are under-capitalized and actuarially under-reserved, with little or no equity available to cover unexpected shortages in cash flow. This in turn has created systemic risk that could leave a multitude of aging Americans financially and medically vulnerable. Democratization of risk. In the same way that catastrophe bonds transfer a specified set of natural catastrophe risks from a sponsor to an investor, our proprietary structure proposes to transfer part of the actuarial risk of a CCRC’s default from aging residents and operators to private investors and insurance companies. Elderly residents protected. If adopted, this structure could effectively mitigate the systemic risk across the CCRC industry, relieve the aging residents of their role as unsecured creditors, and create a new insurance class/product whose actuarial risk can be actuarially priced and regulated. Over the past 50 years, continuing care retirement communities (CCRC), primarily sponsored by faith-based and other nonprofit organizations, have offered living accommodations for active senior adults. These adults are typically in their mid-70s to early 80s and able to live independently once settled into their new residences. These facilities are designed to provide progressively more intensive care, including assisted living, nursing, and memory care as the residents become increasingly frail toward the end of their lives. Under one form of contract, typically referred to as Type A, many of these facilities offer a soft promise to continue to provide care until death, even after a given resident has exhausted his/her personal financial resources. The price of Type A contracts typically includes a six-figure initial entrance fee and ongoing monthly fees, which grow with inflation but not with the level of care required by any particular resident. The implicit assumption is that the facility operator will reserve a sufficient amount of cash from the entrance fee to fund its long-term actuarial obligations. As religious or mission-driven nonprofits, this lifetime care promise is consistent with the philanthropic objectives of the original sponsors and current operators. In reality, however, these structures create highly complex long-term care insurance obligations that most operators do not properly underwrite and that most states do not regulate as the insurance contracts that they are. The result is that many facilities that issue Type A contracts are under-reserved, with little or no equity available to cover unexpected shortages in cash flow. Understanding the looming systemic risk in CCRCs as a result of these under-regulated but deeply embedded insurance products is this article’s first objective. Its second is to present an innovative solution regarding how the industry might bridge its capital and reserve shortfalls by applying well-developed catastrophe bond and mortgage insurance concepts and structures. Continuing care retirement communities are residential alternatives for seniors that offer, under a single contract, an independent living unit (an apartment or cottage), residential amenities, and access to a continuum of long-term care services that residents may require as their health needs change over time. CCRCs got their start over 75 years ago. At this time, primarily religious organizations created these charitable communities to provide lifetime care for their elderly residents in exchange for essentially all of their assets. Though these nonprofit institutions continue to own and operate a large number of CCRCs, a multitude of for-profit companies have since entered the market with similar facilities and services but without the lifetime care guarantees. Skilled nursing and memory care services for residents who become temporarily ill or who require long-term care. Life care or extended contracts (Type A): As the most expensive type of contract, the Type A option offers unlimited assisted living and skilled nursing care without additional charges. This is the contract type that most often includes the soft promise to maintain the level of care until death. Modified contracts (Type B): This contract type offers a fixed set of services for a defined period of time. Type B contracts typically have lower monthly fees relative to Type As while offering similar housing and residential amenities. At contract maturity, services can be continued as required, but for an escalated monthly fee structure. Fee-for-service contracts (Type C): These contracts often require initial enrollment fees that are lower than those of Type A and B contracts, or that are altogether absent. With Type C contracts, some or all of the same residential services and amenities may be provided, but assisted living and skilled nursing services are typically paid for per diem and at the higher market rates. Traditionally, CCRC facilities have been organized and financed primarily as real estate and medical services companies but conceptually also include multiple implicit insurance products, such as long-term care and annuity type obligations. The challenge for the industry and the way it has evolved is that these implied insurance products have not been actuarially underwritten, and the available assets of the sponsors (CCRC operators) are typically insufficient to account for many of the long-term financial obligations that are inherent to these contracts. Instead, operators rely on high current cash flows derived from entry fees, ready access to the tax-exempt bond markets, and going-concern GAAP accounting to finance their operations and capital expenditures. And unfortunately, they do this without establishing appropriate actuarial reserves for the long-term obligations which they have either incurred contractually or promised in their marketing literature. In addition, many CCRC operators have also created refundable entry fee plans, albeit for higher sticker prices than non-refundable fees, which increase current period cash flows in exchange for an unsecured promise to refund most of the entry fees at some point in the future. The most common condition under which these refunds are made are at the point of a given resident’s death or departure from the facility. However, no cash changes hands until a new resident takes the place of the prior at the residence, and replaces the former’s entry fee. The actuarial community is aware of this problem as evidenced by a number of papers that were written in the ’90s. But given the fact that most of these operators are mission-oriented nonprofits with little access to equity capital, and the fact that their cash flow-based operating models have held up reasonably well historically, few meaningful changes have been made in response. Further, regulators have historically been more focused on the quality of care than on the financial health or solvency of the industry’s players. The good news is that this pattern is starting to change as the baby boomers begin to retire, and the financial health and position of the industry becomes more closely evaluated by new participants. By way of illustration and in response to several recent, high profile bankruptcies, legislation was introduced in Florida’s 2017 legislative session requiring operators to hold actuarial reserves for their future incurred liabilities. Despite the industry’s vehement rejection of this legislation, it has been reintroduced for the next session. At this juncture, there seems to be a reasonable probability that changes will be made to address the looming problem. The obvious challenge here, however, is that very few of the operators either have or have access to sufficient capital to comply with a true actuarial reserve requirement, bringing us to the second part of this article. So, based on these requirements, it is possible for an actuarially insolvent entity to meet both GAAP and regulatory going-concern requirements with liquid assets that are far lower than necessary to meet long-term obligations on a present value basis. When coupled with CARF’s data showing long-term debt that ranges between 47% and 105% of total capitalization (defined as unrestricted net assets + long-term debt), the industry needs a way to accumulate real equity while mitigating the residents’ risk of bankruptcy until that capital can be acquired. 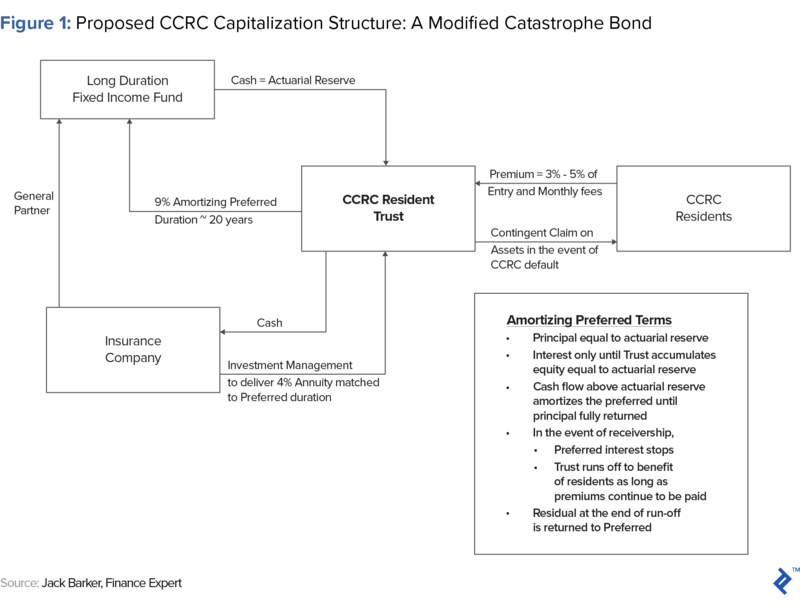 Figure 1 above illustrates a concept for how a modified catastrophe bond structure could be used to socialize the near-term bankruptcy risk of any individual operator, while also accumulating capital to replace the invested capital over time. A long duration fixed income fund (LDFI) would be raised from institutions and high net worth (HNW) individuals. An insurance company would be the most likely sponsor of this fund and would serve as the fund’s general partner. The LDFI would invest in an amortizing preferred share (APS) issued by a trust (see CCRC Resident Trust above) established for the benefit of the residents. These shares would yield a rate of interest (e.g., 9% – 12% per annum) through the term of the contract, which is likely to be 15 – 20 years. The trust would invest this cash with the sponsoring insurance company which would deliver an annuity contract to the trust at a market rate of interest (e.g., 3% – 5%). This annuity would have the same term as the expected term of the APS. Pay back the APS principal once the actuarial reserve requirement has been met. The trust would pay interest only to the APS while it is accumulating equity equal to the required actuarial reserves. This equity would accumulate from the excess of premiums and annuity payments during the interest-only period. Once the trust’s equity is equal to the required actuarial reserve, any excess cash above interest payments would be used to amortize the APS until the principal is fully repaid. The hypothetical model suggests that the term of the APS would be approximately 20 years, with a duration of approximately 10 years. The State Office of Insurance Regulation (OIR) would be charged with monitoring the trust and the operating results of each covered CCRC. If any particular CCRC is unable to meet its creditor obligations while also providing an adequate standard of care to its residents, then the OIR would be empowered to place the CCRC into receivership and appoint a receiver under the supervision of the bankruptcy court. The trust would then be placed into “run-off,” similar to mortgage bond insurance. This run-off period would, in order of priority, be designed to 1) protect the residents through the remainder of their lives, 2) pay principal and interest to the secured bondholders, 3) return principal and interest to the APS investors in the CCRC resident trust, and 4) pay any accumulated refundable entry fees to residents as funds become available. 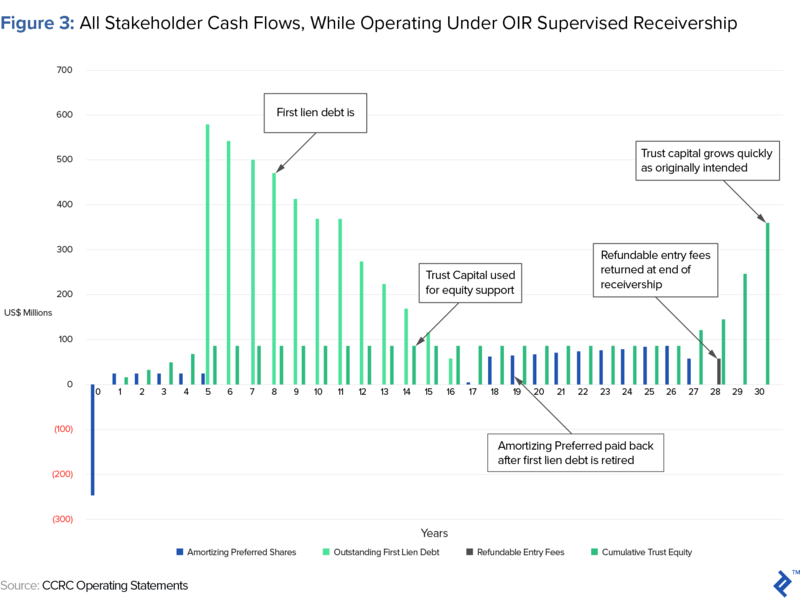 The hypothetical model indicates that if receivership were to happen at year five, the assets available in the trust would be sufficient to achieve all of these objectives over the course of a 30-year run-off period. The next paragraph details an example of one hypothetical receivership scenario for your benefit. Residents stay in place and the facility continues to operate under the existing monthly fee and trust premium structure. Fees are allowed to rise with inflation and at a similar rate as in the past. Entry fees are reduced by 50% as a market inducement to attract new residents and allow the CCRC to operate as a going concern. Refundable entry fees would not be allowed given the credit profile of the CCRC in receivership. Entry fees are assumed to grow slightly faster than inflation from this discounted base until they reach market levels in about 20 years. 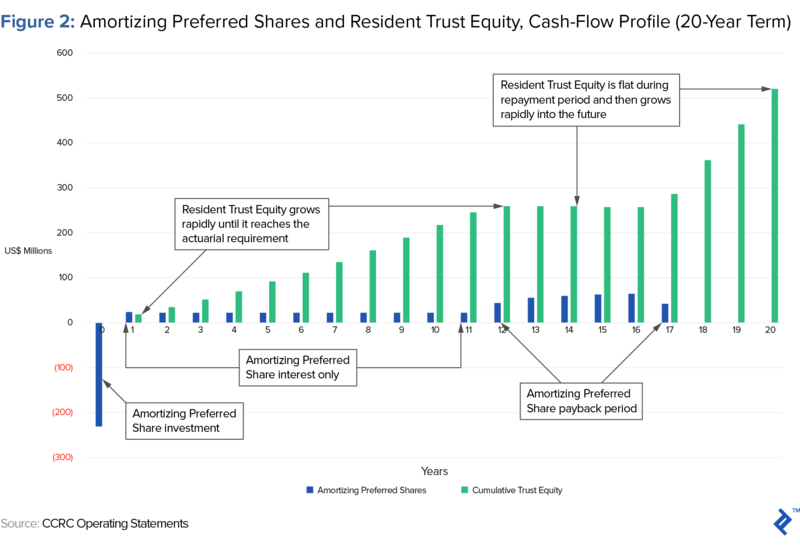 Based on income statements compiled in the hypothetical example, this level of resident funding is sufficient to cover operations and capital depreciation throughout the receivership period. Cash flow from operations that equals depreciation is assumed to be reinvested in capital expenditures so that the facilities do not deteriorate throughout the run-off period, but no new construction is allowed. CCRC resident trust assets are made available to back-stop CCRC operations (likely as security for a revolving line of credit) and to make payments to the secured bondholders until their principal and interest had been returned. Simple interest would continue to accrue on the APS. All earnings from the accumulated capital in the trust. Bondholders would accrue compound interest and be paid 100% of the cash flow from the trust assets in each year of the run-off period until the bondholders have received 100% of their principal and accrued interest. The hypothetical example indicates that the bondholders would be made completely whole after approximately 11 years of the receivership, which is a reasonable outcome given the level of debt and the actual terms of the existing bonds. When the bondholders are paid out, the amortizing preferred shareholders would be paid out of the trust’s cash flow that had previously been paid to the bondholders. Under the modeled scenario, the investors would receive their principal and accrued, simple interest in approximately year 22 of the receivership. They would lose approximately 35% of their investment due to time value declines, but this is a reasonable outcome given the high level of interest payable on these securities and the full nominal recovery in this distress situation. Any existing, contractually agreed, refundable entry fees would continue to accumulate interest-free during the receivership. When the APS holders are paid out, these accumulated refunds would be paid in the order in which they were incurred. The trust assets will be sufficient to meet these obligations in approximately year 26 of the receivership. The real value (as opposed to nominal) will have declined significantly, but since the residents will have been protected securely in their home without disruption throughout the balance of their lives, this is a reasonable outcome for the family members who are likely to inherit these refunds. When all of these payments are made, the trust will then continue to accumulate equity until an appropriate, actuarial reserve is accumulated. At that point, the receivership will end and operations will revert to the nonprofit (or other identified organization) as before. The primary benefit of this receivership structure is that the residents are protected in their homes and investments for the remainder of their life. This is accomplished under reasonable market assumptions and without any extraordinary financial contributions from the state through Medicaid or any other type of fiscal program. The added benefit is that secured bondholders are protected in their investments so that CCRCs would continue to have access to the secured lending market. Finally, the unsecured creditors who invested in the amortizing preferred shares and the residents’ heirs who are expecting refundable fees are also able to recapture some of their value over the course of time. These outcomes are materially better for all involved relative to a Chapter 11 filing whereby the only backstop for the residents is Medicaid, the bondholders’ security is of dubious value relative to the amount of debt, and the refundable fees are a total loss. All of this is enabled by, and dependent on, a regulatory structure that allows private capital to support CCRCs through the CCRC resident trusts as outlined above. The primary issues that must be resolved are adverse selection and moral hazard on the part of each individual CCRC operator and its associated residents. Without a regulatory mandate, only the most insolvent CCRCs would enter the program. This could be solved relatively easily with state insurance rules that required documented actuarial reserves, but these rules would have to be written to allow nonprofits to use a for-profit amortizing preferred share structure as outlined here. Since the funds purchasing the preferred would be taxable on their earnings, this would not appear to be a significant legislative issue. Similarly, the premiums paid by the residents to fund the trusts would need to be structured such that the funds are not subject to operator credit risk. This could be accomplished through either direct payments to the trust, a lock-box/waterfall payment arrangement, or any other, but once again only accompanied by appropriate rules. The premium amount would likely need to be subject to regulatory review to prevent abuse, but as long as this review was actuarial and market-based, the capital need is so great that rational pricing is likely to be allowed. The more difficult task would be to write rules to govern actions and institutional control in the event of a default on the part of a CCRC operator. The approach outlined here would appear to achieve the desired outcomes while appropriately balancing the interest of all parties, but the debate on the specifics is likely to be emotional since the current operators are primarily mission-focused nonprofits. An important step in creating this structure would be to work closely with state legislatures and insurance regulators to define the rules which would allow private capital to help solve this problem in a way that is most beneficial to residents at the lowest possible cost. Given the current proposed legislation, Florida would appear to be an ideal place to start this discussion, and once a model is in place, North Carolina and Maryland would be logical next steps given their history and current regulations. Millions of Americans will require a progressive level of care over the next 40 years. Continuing care retirement communities offer an excellent solution to this problem if they can be properly capitalized to meet their long-term financial obligations. The CCRC resident trust structure described here can help the industry to achieve that objective and will unlock significant financial value for sponsoring insurers and their investors by providing both the CCRC operator and their residents the security and peace of mind which they should expect and deserve in the last years of their lives. Continuing care retirement communities (CCRCs) are residential alternatives for seniors that offer an independent living unit (an apartment or cottage), residential amenities, and access to a continuum of long-term care services that residents may require as they age. How are continuing care retirement communities (CCRCs) financed? CCRCs finance their operations and capital expenditures through a combination of (1) relatively high, one-time entrance fees, (2) recurring monthly fees, and (3) tax-exempt bonds. What are the risks to continuing care retirement communities (CCRCs)? Though CCRCs focus on real estate and medical services, they also offer embedded but unregulated insurance products, often improperly underwritten. As a result, many operators are under-capitalized and under-reserved, creating a systemic risk that could leave residents financially and medically vulnerable. Seeking clarification. You say "CCRC residents would be required to pay a premium, in the range of 3% – 5% of current entrance and monthly fees, to the trust that would: Cover the balance of the interest cost; Accumulate the required actuarial reserve; and Pay back the APS principal once the actuarial reserve requirement has been met. 1) Would the % of entrance fee be a one time payment at the time a resident enters the CCRC? 2) If entrance fees are partially refundable, would premium be paid on both refundable and non-refundable parts? 3) Would the % of monthly fees be paid each month? 4) Would there be separate cohorts of new residents with separate group annuities for each cohort? 5) Who would pick the annuity provider and what would be the front end load? 6) I assume the trust would not be subject to claims of CCRC creditors in bankruptcy (other than residents); correct? 7) In case of a "run on the bank" of resident departures, with numerous refunds owing, and assuming annuity would not have enough value to pay-off at 100% of refunds, how would the trust assets be allocated (preserved)?